“”The fact that the authorities are still turning their backs on numerous events over many decades and some farmers have been visited by men in black, there are obvious signs of covert military scientific groups or indeed aliens acting outside of our normality. There are many other strange and frightening events which occur at cattle mutilation sites with UFOs, strange lights, silent black helicopters, bigfoot and other non human humanoids present or visiting farmers. I draw a clear distinction between this and the animal mutilations from satanic cults and attacks by other animal types which are very clear from the evidence. Cattle mutilation refers to livestock (usually cows, allegedly sometimes horses or other animals such as pets) allegedly found dead with unusual trauma — with organs removed and blood drained. Popular suspected culprits include aliens, "the military" (despite countries of origin varying greatly), and cultists of various kinds, Satanic or otherwise. Silent black helicopters are often claimed to be involved, and often a general mythos regarding other fringe elements is painted up as also having been present at the same site or indicative of the mystery of the location itself. The rationalistic explanation is usually that — aside from the fact that a vast number of these reports are pure conjecture and word of mouth — the times when anything tangible is ever sourced, the animals were partially eaten by scavengers who ate the soft parts first, then the corpses were left in the hot sun for extended periods, as it is a normal occurrence in nature for corpses to go through various stages of asymmetrical decompositional change, i.e. affected greatly by the environment, which is well known to produce strange looking carcasses that are ripe for paranormal explanation. Some incidents may be genuine acts of animal cruelty by human perpetrators. 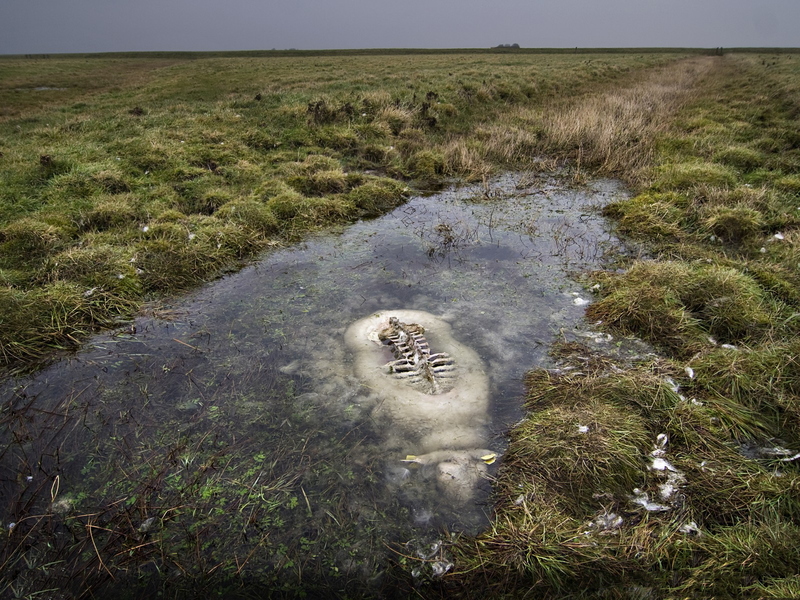 An example of this process of decomposition is visible here, as a drowned sheep has been partially preserved in a bog. Only the parts that were sticking up above the surface were exposed to oxygen and general decomposition, while the submerged parts are preserved for the time being. While many cases have been traced to Edward Scissorhands' enthusiasm for cow tipping, cattle mutilation can also be explained as insurance fraud. Ranchers' insurance policies generally do not cover deaths due to negligence such as disease or poisoning, but do cover human attacks. If the parts of a cow that show disease are removed, the remains can be claimed as a loss. An investigation by the FBI in 1979 concluded that most 'mutilation' incidents were the result of natural deaths and predation, but some cases included anomalies that were not readily explainable. Of course such simple admissions of the limits of an honest investigation are red meat to conspiracy hounds, who take them as admission of positive findings. This phenomenon has become something of a specialty for woo-journalist Linda Moulton Howe. It was the theme of her 1980 video documentary Strange Harvest, and she has followed up with many reports since then. Howe favors the aliensdidit theory. ↑ David Icke's Official Forums — View Single Post — Cattle mutilations: aliens? ↑ See the Wikipedia article on cattle mutilation. ↑ "Cattle 'mutilation'", The Skeptic's Dictionary. ↑ See the Wikipedia article on cattle mutilation. for a more detailed summary of the findings and links to online copies of the FBI documents.